travel and teamwear. Your style, your colours. 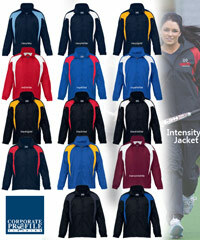 and our most popular activewear jackets are the Intensity Sports Team Jackets. Navy and Slate. Mens, Ladies and Kids. Warm bonded micro fleece on the inside. Changeable coloured zip pullers available for Company, School and Club presentation. Style #Hudson. Sizes XXS to 3XL and 5XL. 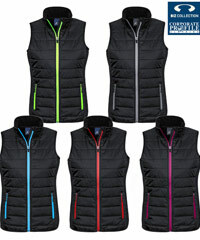 Puffer Vest also available Style #Loma. through the year. Water and Wind repellant. Dressed up with a shirt, polo or tee...perfect! Outstanding Prices for Company uniforms! Men, Women and Kids for Schools. is warm perfect for outdoors staff in cold. 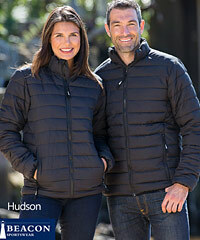 Exceptional Outerwear by Harvest Sportswear. Top Notch. Navy, Black, White. 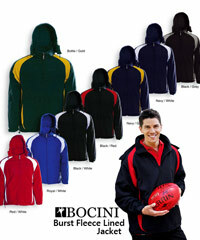 Company Uniforms and Sports Clubs. warm fleece lining. Quality Zippers. From $78.00 each (10 pcs) ex GST. appearance just like Department Store brands! Cyan Blue. 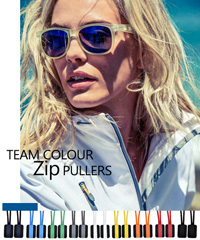 Optional team colour zip pullers. for warmth, easy wearing comfort. Looking good in new arrival Puffers! Super for Business, Sport Clubs, Students. Lightweight polyfill but warm, styled fit. So impressive with your own logo. One of the best jackets for a sweet price. looking for lowest price value. Retail Styled. Snug fit, warm bonded micro fleece lining. Customers include Nurses, iTech & Transport. A retail look combining style and function. TPU coating, water repellant rating 10,000mm. coating, water repellant rating 10,000mm. Heritage is 100% Cotton Twill. Garment washed treatment for comfort. lining, poly-fill padding for warmth. Lightweight but really warm. Seams Sealed. Black, Royal Blue, Charcoal and Navy. From $81.80 (20 pcs) ex GST. Super Value for Warmth,and Workwear. Inside body lined with warm micro fleece. From $74.00 each (10 pcs) ex GST. 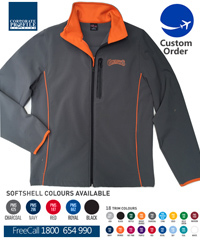 Cold weather warmth for Work or Teamwear. Includes Plain-Solid Black and Navy. storm flap over full zip front. Highly recommended for Outdoor Uniforms. Our Price $59.80 (20 pcs) ex GST. hidden hood, storm flap over full zip front. Highly recommended for Company Uniforms. lining on the inside. Hood under collar. Vented back panel for breathability. From $39.23 each (20 pcs) ex GST. outdoor activities. Show off your brand colours. Puffer Vest is handy at any time of year. Fully fashioned style and comfortable fittings. For indoor and outdoor activities. Puffer Jacket is handy at any time of year. Thumb Loops to keep hands warm. Whistler Soft Tech with down like insulation. allowing plenty of movement and comfort. 3000g/m; Windproof. Matching Polo's & Shirts. Plain Black. Insulative, Water & Wind Resistant. embroidered logo's. Navy, Charcoal and Black. Vests also available. Ticks all the boxes. events, staff uniforms, teams and clubs. Awesome Nylon-Polar Fleece lined jacket. Company-Team colours with Piping finish. A large range of sizes to fit everyone! Sizes from 'Extra Extra Small' up to 7XL. From $53.72 each (20 pcs) ex GST. piping. Versatile for Workwear or Sports. Includes Extra Small to 3XL. Polar Fleece comfort band inside the collar. microfleece lining on the inside. One of our most popular Club items. A winner for Sports Clubs, Footy and Netball. 8 team colours. Adults, Student & Kids sizes. A great suggestion for Business & Clubs. extra deep pockets to keep hands warm. Womens are Snug fitting. Top value item. Anti pill. Black and Navy. Warm 350 gram. One of our best selling items for Winter. From $32.80 each (20 pcs) ex GST. Teammate Jacket #JK18 and Vest together! Nylon outer shell, with warm micro fleece lining. Black/Red. Best seller, tremendous value. Reflective piping, hood, chunky zips. From $74.59 (20 pcs) ex GST. and Gold. and more. All sizes for Kids-Adults. From $39.52 each (20 pcs) ex GST. sports jackets. 8 Team Colours. Half lined with micro fleece, stay warm. Great quality jackets at a fantastic price. High quality product. Air Express Service. Green, Royal and Dark Grey. Chest pocket with ID Card pouch. Inside pockets. Thumb grip in sleeves. microwax. Water resistant and wind resistant. Lined inside with anti-pill micro-polar fleece. for cold conditions. White, Red, Navy, Black. From $87.41 (20 pcs) ex GST. an awesome appearance and fit. Our Price from $80.83 (20 pcs) ex GST. Printer Brand Jackets to tailor your needs. Zip pullers are sold separately. Ask Us How! Sport + Style #FLATTERY Zip Vest. Outer pocket and 2 Inside Pockets. all with Zips. Drawstring at hem. 260gsm. Premium Fleece Vest With Wind Membrane. week-ends, Black/Red, Navy/Sky and Red. the neck and chest zipper. an embroidered company or club logo. Also available in Red, Black and Navy. 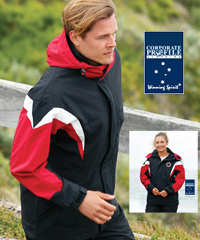 decorative top stitch, full front zip, zippered pockets, chin guard, fashioned fit. polyester inners for warmth. Chunky zipper. Insulative, Stretch. Great Brands. Great Price! For active workwear and recreation. Unisex Extra Small to 3XL. Reversible. Warm Polar Fleece on the Inside. From $28.94 (20 pcs) ex GST. Tough wearing with warming fleece inside. From $46.33 (20 pcs) ex GST. with warm micro polar fleece on the inside. Brilliant for cold outdoor Workwear and Sport. Teamwear, merchandise, travel groups etc. Sturdy Nylon outer with warm fleece lining. stud storm front, high wind collar. Red, Royal and Navy. Durable for workwear. From $42.00 (20 pcs) ex GST. 18 colours for trims and piping. Express Indent Service, Minimum 50 pcs. From $76.80 (Min 50 pcs) ex GST. Navy, Black, White, all with Grey Steel trims. Breathable, Shieldtech, Stretch 3 Layer Bonded. From $88.42 each (Min 20 pcs) ex GST. Black (995), Team Red (358) Royal (561). Same style #JK31 is available in Black/Grey. Versatile for outdoor workwear or business. for warmth in very cold conditions. 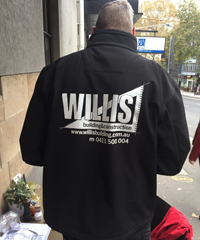 Great jacket for uniforms with company logo. From $58.94 (10 pcs) ex GST. micro fleece lining. 3 Colour combinations. Useful, all year product. Packs in a pouch. Mesh lining. Navy, Red, Royal and Black. Now available in Childrens 4 to 14 yrs. From $22.42 (20 pcs) ex GST. events, everything! Modern design materials. with cool mesh lining on the inside. From $39.16 (20 pcs) ex GST. Most popular colours including Marle Grey. Durable quality, chunky waist and cuff ribs. Soft and warm! Will last for years. Embroidered badge service is available. nylon shower proof outer shell. Reflective trims. Lined with good quality Brushed Cotton. in collar, jacket for use all year round. Awesome jackets for teamwear and uniforms. Wind resistant, Breathable, Quality zippers. Warm Micro fleece lining on the inside. Mens and Ladies Size Range. From $69.59 (20 pcs) ex GST. teamwear and business package uniforms. Mens and Ladies sizes. 4 Colours Sets. Bonded micro fleece lining. Vests also. From $53.29 each (20 pcs) ex GST. Stomp Backpack is Melange fabric. inspired, moisture wicking spandex fleece. cuffs. Mens SM-5XL, Ladies XS-2XL. The Jobman Softshell jacket prints beautifully. We can quote based on your requirements. *Low Minimum 20 pcs applies.